With the blessings of Their Holinesses the Shankaracharyas of Shri Kanchi Kamakoti Peetham, Kanchipuram, Tamil Nadu, a Vishva Shanti Maha Yajna is being organized in the Zeashta Devi Shrine premises at Shrinagar, Kashmir from September 1st to 10th, 2011. This Vishva Shanti Maha Yajna is being performed for the welfare of one and all by learned Vedic scholars from South India. First Ganapati Havan will be done for removal of all obstacles. 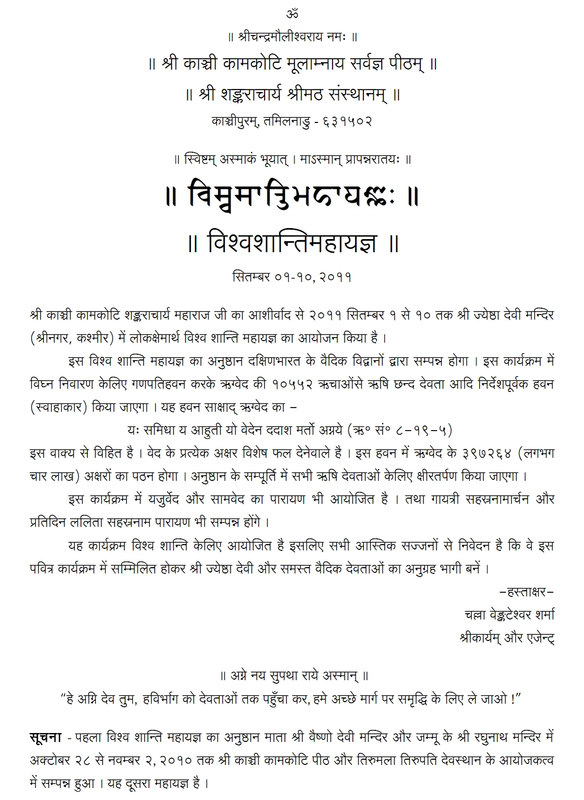 Then Rig Veda Havan will be done by chanting 10,552 mantra-s of the Rig Veda, each with their own unique Rishi (sage who discovered the mantra), Chandas (poetic metre) and Devata (deity). Each syllable in the Veda mantra-s has beneficial effects of its own, and 3,97,264 (almost four lakh) syllables of the Rig Veda will be chanted in the course of this havan. At the end, tarpana (oblations of milk) will be offered to all the Rishi-s and Devata-s of the Rig Veda. Likewise, chanting of Yajur Veda and Sama Veda is also arranged for. There will also be Gayatri Sahasranama Archana and daily chanting of Lalita Sahasranama. As this is being done for the welfare of one and all, all are invited to come and receive the blessing of Shri Zeashta Devi and all the Vedic Deities invoked in the havan. Note: The first Vishva Shanti Maha Yajna was performed at Mata Shri Vaishno Devi Shrine and in Jammu from October 28th to November 2nd, 2010 by the efforts of Shri Kanchi Kamakoti Peetham as well as Tirumala Tirupati Devasthanams. This is the second Maha Yajna.